In Human Voices I found a different Penelope Fitzgerald than the one I am used to. I guess having only previously read two other Fitzgerald novels I don’t qualify as an expert, but this one feels very different than The Gate of Angels or The Bookshop. There is something much more straightforward about Human Voices than the others. It feels less oblique, more tangible. More accessible. 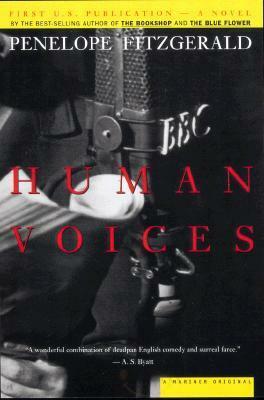 Drawn from Fitzgerald’s own work experience, Human Voices takes place in the halls of Broadcasting House (the BBC’s London headquarters) during World War II. Like the other Fitzgeralds I have read, this is a novel of details with just a gentle arc of a plot. Things happen – some very dramatic indeed – and there is a certain peak to the plot, but overall this isn’t one of those narratives that builds and builds towards one inexorable, unavoidable climax. Instead the reader is treated to the stories of various BBC employees whose lives become increasingly interrelated. As the air raids and war effort in general escalate, the lines between work and personal lives become blurred as the intensity of both mirrors the intensity of war. What is amazing about Human Voices is Fitzgerald’s ability to give dimension to so many characters in only 143 pages. There are certainly plenty of minor characters – not everyone gets equal treatment – but at no point did I feel like there wasn’t a whole character beneath the surface even when the character was not explicitly fleshed out. And through it all Fitzgerald manages to convey a sense that the “stiff upper lip” had plenty of soul and emotion behind it. She captures the spirit of the blitz without turning any of it into caricature. This is a must read for anyone interested in wartime London, providing further dimension to a place and time with a seemingly endless supply of unique and extraordinary stories. Sounds like a really interesting story. Great review – think I'll be adding this to my “to read” list. I've read the other Penelope Fitzgerald novels you've read, and I like them but somehow I'm never quite satisfied with them. This one sounds great, though. Books: It is definitely an interesting story, and I didn't even really go into the interesting bits. Anna: Like I said, to me it felt very different. And I totally understand what you mean by not quite satisfied with PF. How strange – I found this more *less* accessible than The Bookshop! I nearly gave up on PF after this – I thought it was ok, but a bit bewildering, and I never quite knew where I was – whereas I loved The Bookshop. Maybe it's a case of getting used to the author, regardless of where you start? Those are still the only two I've read.